Cancer Network presents exclusive coverage on thyroid cancer from the 15th International Thyroid Congress (ITC) and 85th Annual Meeting of the American Thyroid Association (ATA), held October 18-23 in Lake Buena Vista, Florida. Release of newly revised, evidence-based clinical management guidelines for thyroid nodules and differentiated thyroid cancers were announced at the 85th Annual Meeting of the ATA. The FAM83F protein contributes to papillary thyroid cancer cell viability and doxorubicin resistance, according to a study presented at the 85th Annual Meeting of the ATA. 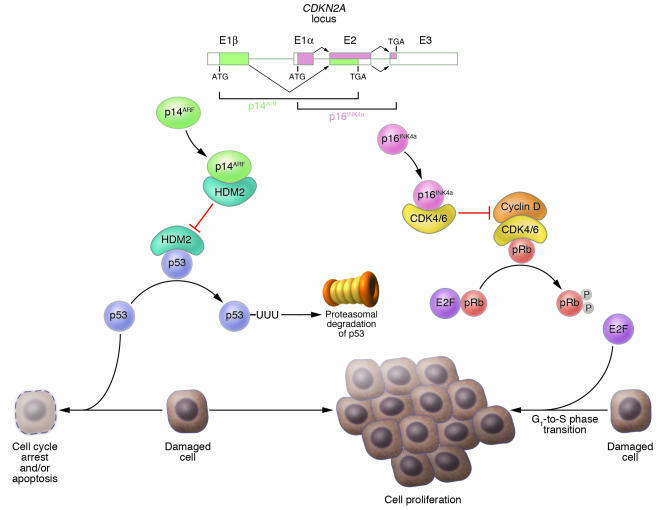 Preclinical findings suggest that autophagy inhibition might prove useful in overcoming BRAF-mutant thyroid cancers resistant to vemurafenib. Release of newly revised, evidence-based clinical management guidelines for thyroid nodules and differentiated thyroid cancers were announced at the 15th International Thyroid Congress (ITC) and 85th Annual Meeting of the American Thyroid Association (ATA) in Lake Buena Vista, Florida, and published in Thyroid. The ATA Guidelines Taskforce on Thyroid Nodules and Differentiated Thyroid Cancer authored the guidelines. The Taskforce was chaired by Bryan R. Haugen, MD, of the University of Colorado School of Medicine in Aurora, Colorado. the diagnosis and the initial and long-term management of differentiated thyroid cancer. The United States saw an estimated 63,000 newly diagnosed cases of thyroid cancer cases in 2014, up sharply from 37,200 in 2009, when the ATA guidelines were last revised. The U.S. Food and Drug Administration today approved Zelboraf (vemurafenib), a drug to treat patients with late-stage (metastatic) or unresectable (cannot be removed by surgery) melanoma, the most dangerous type of skin cancer. Zelboraf is specifically indicated for the treatment of patients with melanoma whose tumors express a gene mutation called BRAF V600E. The drug has not been studied in patients whose melanoma tests negative for that mutation by an FDA approved diagnostic. Zelboraf was reviewed under the FDA’s priority review program that provides for an expedited six-month review of drugs that may offer major advances in treatment or that provide a treatment when no adequate therapy exists. Zelboraf and the companion BRAF V600E test are being approved ahead of the drug’s Oct. 28, 2011 goal date and the companion diagnostics’ Nov. 12, 2011 goal date. Zelboraf’s safety and effectiveness were established in a single international trial of 675 patients with late-stage melanoma with the BRAF V600E mutation who had not received prior therapy. Patients were assigned to receive either Zelboraf or dacarbazine, another anti-cancer therapy. The trial was designed to measure overall survival (the length of time between start of treatment and death of a patient). The median survival (the length of time a patient lives after treatment) of patients receiving Zelboraf has not been reached (77 percent still living) while the median survival for those who received dacarbazine was 8 months (64 percent still living). “Today’s approval of Zelboraf and the cobas test is a great example of how companion diagnostics can be developed and used to ensure patients are exposed to highly effective, more personalized therapies in a safe manner,” said Alberto Gutierrez, Ph.D., director of the Office of In Vitro Diagnostic Device Evaluation and Safety in the FDA’s Center for Devices and Radiological Health. The FDA’s approval of the cobas 4800 BRAF V600 Mutation Test was based on data from the clinical study that also evaluated the safety and effectiveness of Zelboraf. Samples of a patient’s melanoma tissue were collected to test for the mutation. The most common side effects reported in patients receiving Zelboraf included joint pain, rash, hair loss, fatigue, nausea, and skin sensitivity when exposed to the sun. About 26 percent of patients developed a skin-related cancer called cutaneous squamous cell carcinoma, which was managed with surgery. Patients treated with Zelboraf should avoid sun exposure. Zelboraf is being approved with a Medication Guide to inform health care professionals and patients of Zelboraf’s potential risks. The FDA has very recently (May 29, 2013) approved two new drugs to treat unresectable and metastatic melanoma. Both drugs are inhibitors of B-Raf which is frequently mutated in melanoma (1). The new drugs are products of GlaxoSmithKline (GSK): Dabrafenib (marked as Tafinlar), a B-Raf inhibitor aimed to treat melanoma patients harboring V600E mutation (2), and Trametinib (marked as Mekinist), a MEK inhibitor that was shown in phase III clinical trials to be efficient for treating melanoma patients with BRAF V600E or V600K mutations (3). Both drugs are given orally and approved as single agents. About 75,000 new cases of melanoma are being diagnosed in the US and above 9,000 people die from the disease, each year. Until recently metastatic melanoma was considered an incurable disease with very poor prognosis and limited survival rates. These new two drugs are now joining the first two drugs approved in 2011 to treat metastatic melanoma that are already in clinical use – vemurafenib (Zelboraf) which is also a B-Raf inhibitor (4), and ipilimumab (Yervoy). The introduction of the two drugs was co-approved in concert with the THxID BRAF test from BioMérieux. This PCR-based BRAF test is designed to determine whether a melanoma patient harbors the V600E or V600K BRAF gene mutation and will assist directing the correct treatment to be given to patients. This BRAF mutation test is the second companion diagnostic approved for BRAF mutation detection following the approval of Roche’s cobas 4800 BRAF V600 Mutation Test in August 2011. Overall, the association of diagnostics with treatments as approved in this case is another step further in the ongoing efforts invested by pharmaceutical and diagnostic companies toward establishing personalized medicine to treat cancer patients. 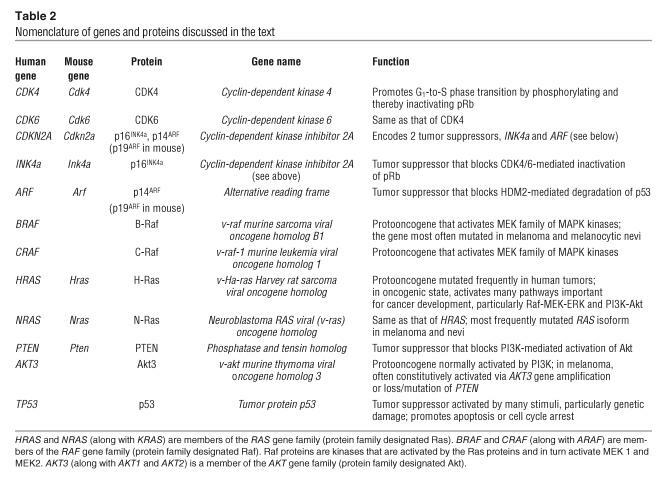 Mutations of the BRAF gene in human cancer. Davies H et al. Nature. 2002 Jun 27;417(6892):949-54. Dabrafenib in BRAF-mutated metastatic melanoma: a multicentre, open-label, phase 3 randomized controlled trial. Hauschild A et al. Lancet. 2012 Jul 28;380(9839):358-65. In the last post of Melanoma titled “In focus: Melanoma Genetics”, I discussed the clinical characteristics and the genetics involved in Melanoma. This post would discuss melanoma therapeutics, both current and novel. According to the American Cancer Society, more than 76,000 new cases and more than 9100 deaths from melanoma were reported in the United States in 2012 Melanoma develops from the malignant transformation of melanocytes, the pigment-producing cells that reside in the basal epidermal layer in human skin. Although most melanomas arise in the skin, they may also arise from mucosal surfaces or at other sites to which neural crest cells migrate. Surgical treatment of cutaneous melanoma employs specific surgical margins depending on the depth of invasion of the tumor and there are specific surgical treatment guidelines of primary, nodal, and metastatic melanoma that surgeons adhere to while treatment. Melanoma researchers have been focusing on developing adjuvant therapies for that would increase the survival post-surgery. Among traditional chemotherapeutic agents, only dacarbazine is FDA approved for the treatment of advanced melanoma (Eggermont AM and Kirkwood JM, Eur J Cancer, Aug 2004;40(12):1825-36). Dacarbazine is a triazene derivative and alkylates and cross-links DNA during all phases of the cell cycle, resulting in disruption of DNA function, cell cycle arrest, and apoptosis. Currently, 17 clinical trials are underway to test the efficacy and effectiveness of dacarbazine against melanoma as either a single agent or in combination chemotherapy regimens with other anti-cancer chemotherapeutic agents such as cisplatin, paclitaxel. Temozolomide is a triazene analog of dacarbazine and is approved for the treatment of malignant gliomas. At physiologic pH, it is converted to a short-lived active cytotoxic compound, monomethyl triazeno imidazole carboxamide (MTIC). 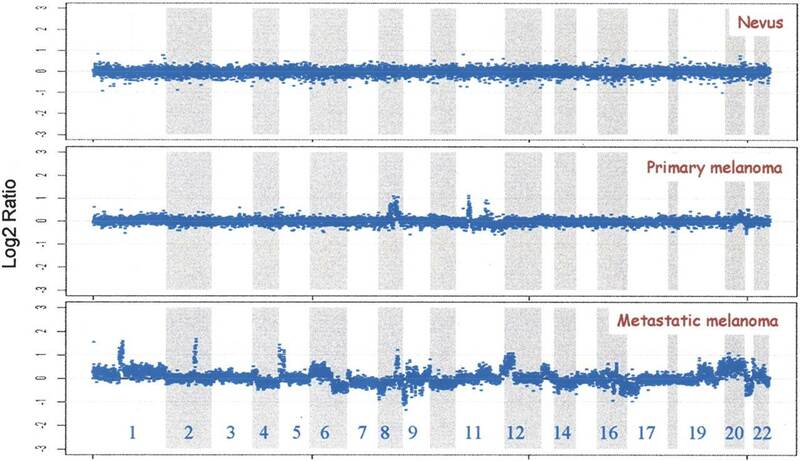 MTIC methylates DNA at the O6 and N7 positions of guanine, resulting in inhibition of DNA replication. Unlike dacarbazine, which is metabolized to MITC only in the liver, temozolomide is metabolized to MITC at all sites. Temozolomide is administered orally and penetrates well into the central nervous system. Temozolomide is being tested in many combination regimens for patients with melanoma metastatic to the brain (Douglas JG and Margolin K, Semin Oncol, Oct 2002;29(5):518-24). Melanoma and the immune system are closely related. Hence, immunotherapy has been explored in the treatment of the disease. The two most widely investigated immunotherapy drugs for melanoma are Interferon (IFN)-alpha and Interleukin-2 (IL-2). The role of IFNalpha-2b in the adjuvant therapy of patients with localized melanoma at high risk for relapse was established by the results of three large randomized trials conducted by the US Intergroup; all three trials demonstrated an improvement in relapse-free survival and two in overall survival. One of these trials, a large randomized multicenter trial performed by the Eastern Cooperative Oncology Group (ECOG), in high-risk melanoma patients showed significant improvements in relapse-free and overall survival with adjuvant IFN-α-2b therapy, compared with standard observation (ECOG 1684). The results of the study led to FDA approval of IFN-α-2b for treatment of melanoma. This study was performed on patients with deep primary tumors without lymph node involvement and node-positive melanomas. In other studies, little antitumor activity has been demonstrated in IFN-α-2b–treated metastatic stage IV melanoma. Recombinant IL-2 showed an overall response rate of 15-20% in metastatic melanoma and was capable of producing complete and durable remissions in about 6% of patients treated. Based upon these data, the US FDA has approved the use of high-dose IL-2 for the therapy of patients with metastatic melanoma. Aldesleukin (Brand name: Proleukin) is a recombinant analog of the endogenous cytokine interleukin-2 (IL-2). It binds to and activates the IL-2 receptor (IL-2R), followed by heterodimerization of the IL-2R beta and gamma(c) cytoplasmic chains; activation of Jak3; and phosphorylation of tyrosine residues on the IL-2R beta chain, resulting in an activated receptor complex (NCI). 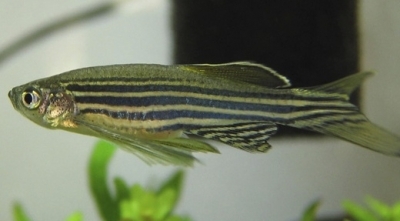 The activated complex recruits several signaling molecules that act as substrates for regulatory enzymes associated with the complex. It is administered intravenously and stimulates lymphokine-activating killer (LAK) cells, natural killer (NK) cells and the production of cytokines such as gamma interferon (nm|OK). Several clinical trials are currently underway using Aldesleukin to determine the efficacy of combination treatment in melanoma patients. Approximately 90% of BRAF gene mutations involve valine (V) to glutamic acid (E) mutation at number 600 residue (V600E). 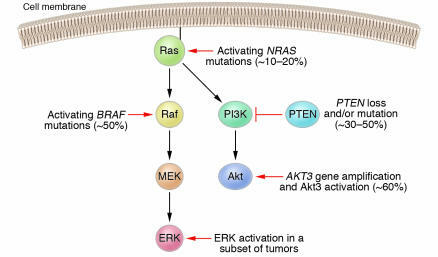 The resulting oncogene product, BRAF (V600E) kinase is highly active and exhibits elevated MAPK pathway. The BRAF(V600E) gene mutation occurs in approximately 60% of melanomas indicating that it could be therapeutically relevant. Vemurafenib (Brand name: Zelboraf) is a novel small-molecule inhibitor of BRAF (V600E) kinase. It selectively binds to the ATP-binding site and inhibits the activity of BRAF (V600E) kinase. Vemurafebib inhibits over active MAPK pathway by inhibiting the mutated BRAF kinase, thereby reducing tumor cell proliferation (NCI). Encouraging results of phase III randomized, open-label, multicenter trial were reported recently at the 2011 ASCO meeting (Chapman PB, et al, ASCO 2011, Abstract LBA4). The trial compared the novel BRAF inhibitor vemurafenib with dacarbazine in patients with BRAF-mutated melanoma. Previously untreated, unresectable stage IIIC or stage IV melanoma that tested positive for BRAF mutation were randomized (1:1) to vemurafenib or dacarbazine. The response rate (RR) was significantly high (48.4%) in vemurafenib treated patients as compared to 5.5% in dacarbazine among the 65% of patients evaluable for RR to date. In addition, vemurafenib was associated with significantly improved OS and PFS compared to dacarbazine in patients with previously untreated BRAF (V600E) mutation bearing patients with metastatic melanoma. Biochemothreapy combine traditional chemotherapy with immunotherapies, such as IL-2 and IFN-α-2b. These combination therapies seemed promising in phase II trials, however, seven large studies failed to show statistically significant increased overall survival rates for various biochemotherapy regimens in patients with stage IV metastasis (Margolin KA, et al, Cancer, 1 Aug 2004;101(3):435-8). Owing to inconsistent results of the available studies with regard to benefit including RR, OS and progression time, and consistently high toxicity rates, clinical practice guideline do not recommend biochemotherapy for the treatment of metastatic melanoma (Verma S, et al, Curr Oncol, April 2008; 15(2): 85–89). The use of therapeutic vaccines is an ongoing area of research, and clinical trials of several types of vaccines (whole cell, carbohydrate, peptide) are being conducted in patients with intermediate and late-stage melanoma. Vaccines are also being tested in patients with metastatic melanoma to determine their immune effects and to define their activity in combination with other immunotherapeutic agents such as IL-2 or IFNalpha (Agarwala S, Am J Clin Dermatol, 2003;4(5):333-46). In fact, recently investigators at the Indiana University Health Goshen Center for Cancer Care (Goshen, IN) conducted a randomized, multicenter phase III trial involving 185 patients with stage IV or locally advanced stage III cutaneous melanoma. The patients were assigned into treatment groups with IL-2 alone or with vaccine (gp100) followed by IL-2. The vaccine-IL-2 group had a significantly improved OR as compared to the IL-2-only group (16% Vs. 6%) and longer progression free survival (2.2 months Vs. 1.6 months). The median overall survival was also longer in the vaccine-interleukin-2 group than in the interleukin-2-only group (17.8 months Vs. 11.1 months). Thus, a combination of vaccine and immunotherapy showed a better response rate and longer progression-free survival than with interleukin-2 alone in patients with advanced melanoma (Schwartzentruber DJ, et al, N Engl J Med, 2 Jun 2011;364(22):2119-27). Earlier, there were essentially two main options for patients suffering from advanced melanoma, dacarbazine and IL-2. Dacarbazine, a chemotherapeutic agent produces modest improvements in survival or symptomatic benefits in most patients. Interleukin-2 -based drugs, on the other hand, induce long-term remissions in a small group of patients but are highly toxic. Recently, FDA approved ipilimumab and vemurafenib for patients with metastatic melanoma. Apart from these, therapies are also aiming at starving the tumor by inhibiting angiogenesis or depleting nutrients essential for cancer growth. Of the antiangiogenic compounds, VEGFR inhibitors SU5416 and AG-013736 demonstrated broad-spectrum antitumor activity in mice bearing xenografts of human cancer cell lines originating from various tissues, including melanoma. In addition, several trials are currently underway to test the efficacy of the drugs in combination. In the future, personalized medicine-based recommendations of novel and existing drugs for melanoma patients might be the way to go. Chudnovsky Y, et al, J Clin Invest, Apr 2005;115(4):813-24. In focus: Melanoma Genetics Curator- Ritu Saxena, Ph.D.